In Sausalito, across the bay from San Francisco, I rented a bike and took the ferry to the city. 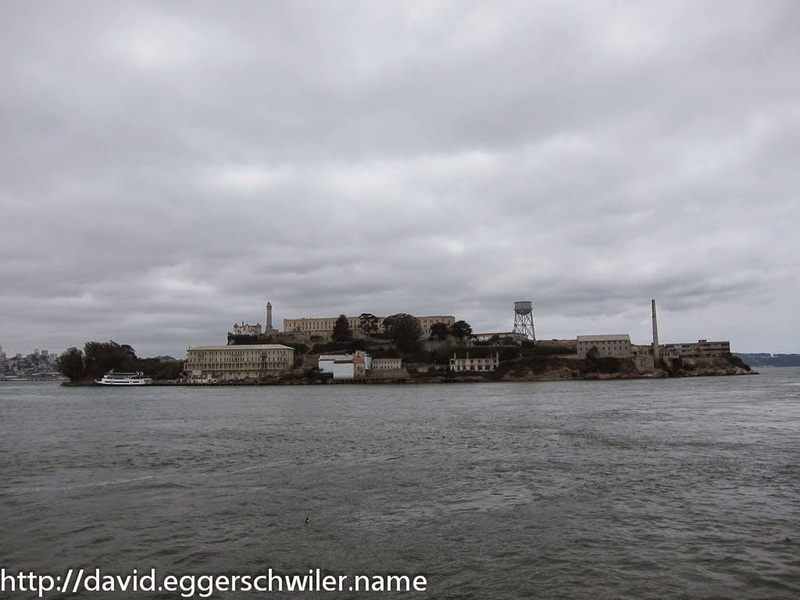 On the way we slowed down so that everyone could take pictures of the famous Alcatraz prison, which I didn't visit, because tickets are regularly sold out 3-weeks in advance. It sounded like a good idea at the time. 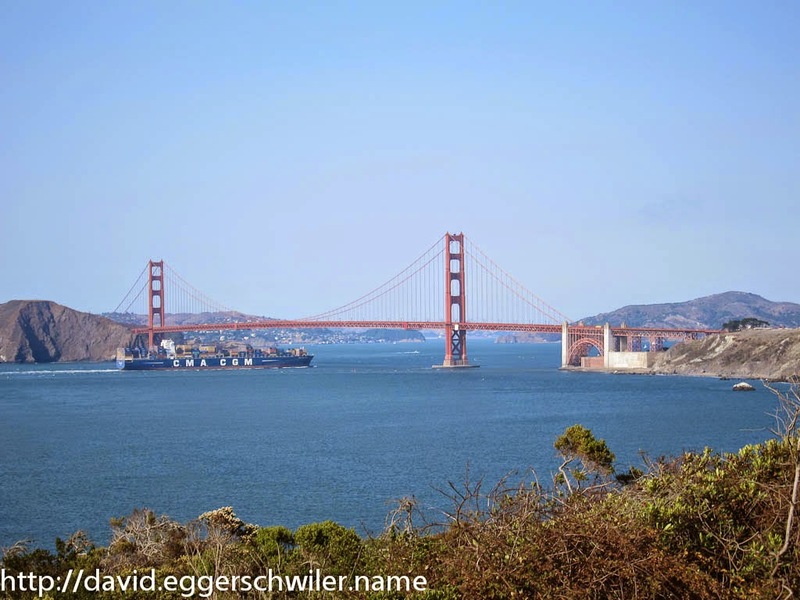 Biking across SF, finding a couple of Caches and returning across the Golden Gate Bridge. What I did not fully realize at the time was, that San Francisco was so extremely hilly! Approaching the first Cache, which was located in Coit Tower, left me winded and I ended up pushing and carrying the bike up the street and up stairs! But the effort was well worth it. 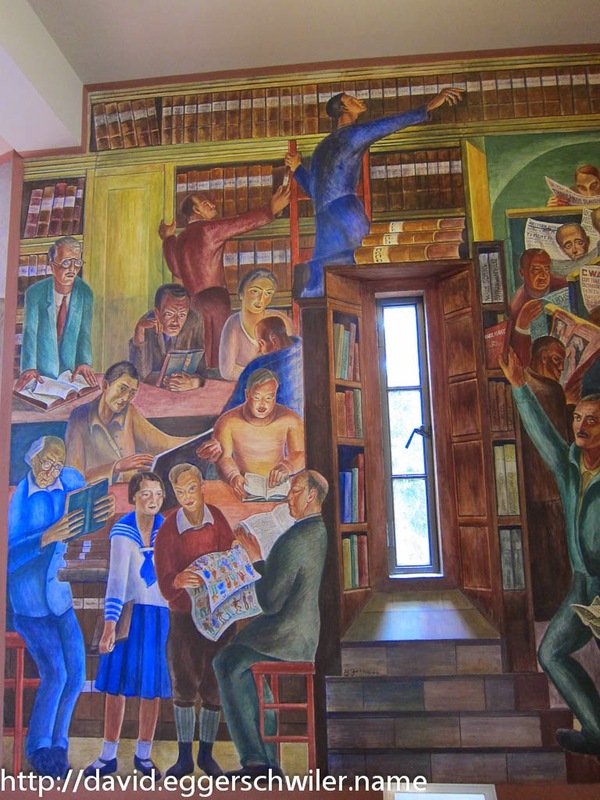 Inside Coit Tower one can see beautiful murals depicting different aspects of life in and around the city during the 1930s. 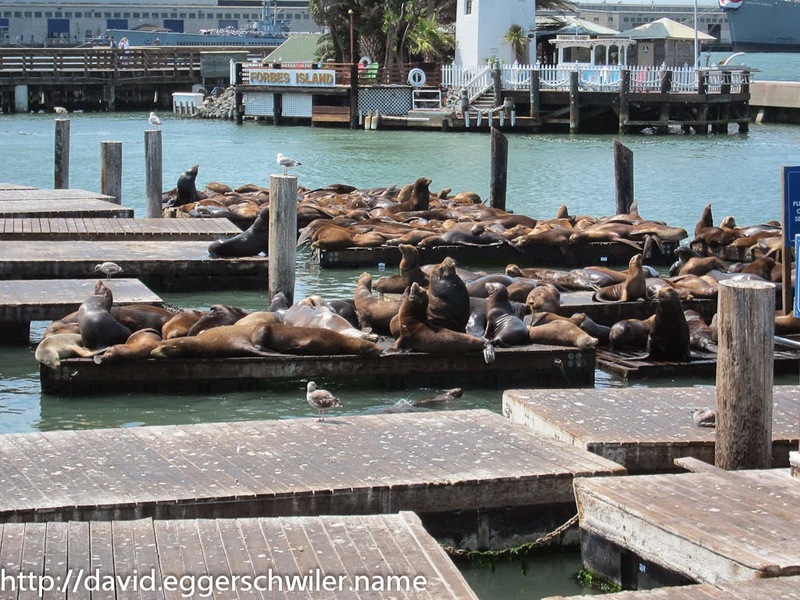 Next came a fun down-hill part to Pier 39, which is just packed with tourists, restaurants, shops and, hidden to one side, sea lions! What a ruckus they made! 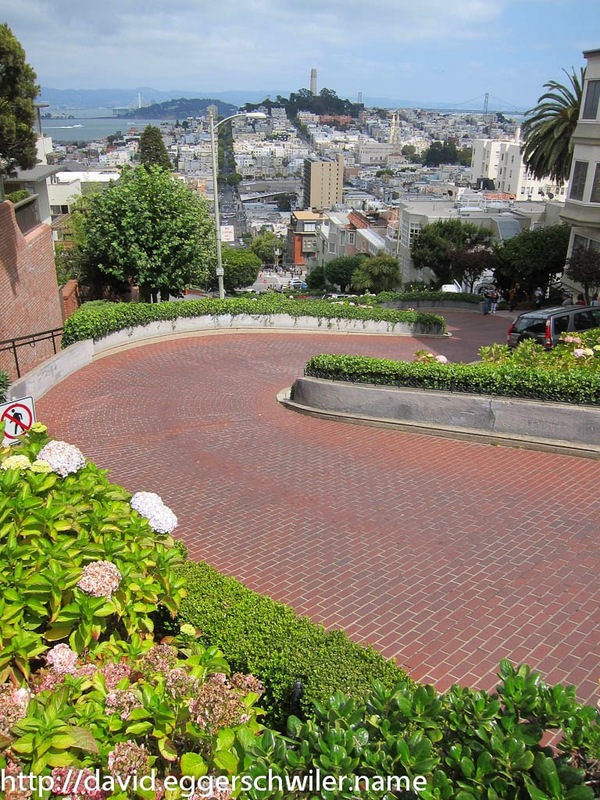 Something everyone thinks off first when San Francisco is mentioned, or maybe second after the free love movement of the 60s ;), is Lombard street. 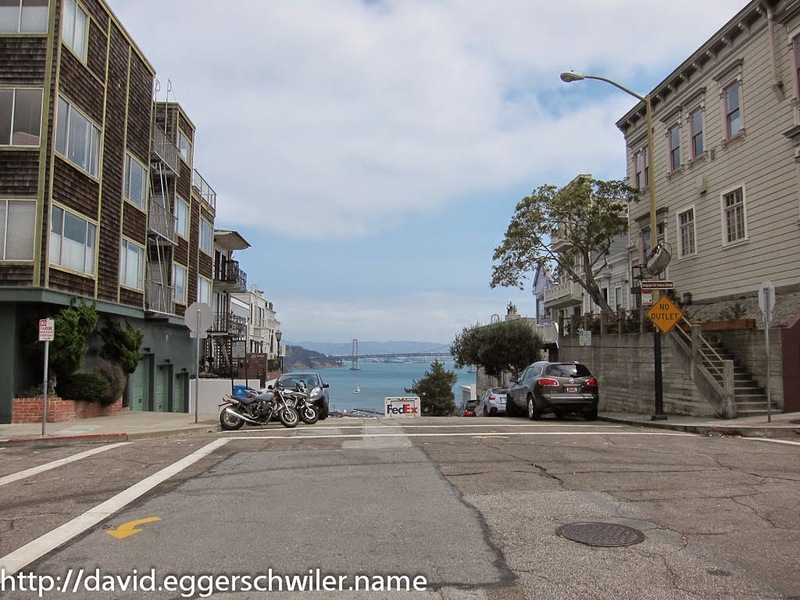 So I collected my strength and pushed the bike uphill again... Driving down Lombard street, was an exercise in breaking, but still an interesting experience :). After another speedy down-hill bit, I ended up at the Community Gardens near the Seafront. In a secluded little spot, a garden community has found it's home, and right in the middle of it, the oldest continuous Cache in SF :). Riding along the waterfront, with an evil oncoming wind making my live difficult, brought me to the Golden Gate Bridge. But since I still had time, I rode on past it to China Beach and Land's End. I couldn't really enjoy the downhill part, knowing well that I had to bike that up again :(... But it offered me a nice alternate view of the Bridge. After a long and arduous climb back up the hill again, I reached the Golden Gate Bridge and biked across it. Unfortunately, we had to use the westbound lane, so views of the city were obstructed by 6 lanes of traffic. A short stretch on the other coast, which went first down- then up- and then downhill again, I reached Sausalito again and duly returned the bike. Together with the morning hike, that had been a long, strenuous but also very entertaining day!